AMMONNEWS - Jordan started on Sunday receiving half of its daily needs of natural gas for electricity production from Egypt, an official said Sunday. The official, who asked not to be named, told Xinhua that the move came after an agreement signed between Egypt and Jordan in early January under which Egypt pledged to provide Jordan with half of its needs of gas for power production in 2019. The official emphasized on the importance of the agreement for reducing Jordan's energy bill. "This is a very important step that will support the Jordanian economy," economist Hosam Ayesh told Xinhua. "The Egyptian gas will help increase the competitiveness of the Jordanian industries as the cost of energy is a main obstacle the industries usually face," the economist said. Energy-poor Jordan needs 330 million cubic feet of natural gas per day for power production, according to the Ministry of Energy and Mineral Resources. 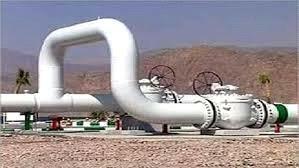 Jordan used to receive around 250 million cubic feet of gas per day from Egypt in 2004. The volumes were reduced in 2009 and came to complete halt in 2011 after attacks by terrorist groups on the pipeline in Sinai that provided gas to Jordan. After the halt of Egyptian gas, Jordan resorted to importing more expensive liquefied natural gas.